The classic triad of back pain, fever, and neurological symptoms is only present in 8-15% of cases. [6,7] Back pain, fever, and elevated ESR and/or CRP with new neurologic symptoms is more suggestive of SEA. The lack of fever in a patient with back pain does not rule out SEA, as fever is only present 30-50% of cases. [2,3] Approximately 85% have at least one of the above risk factors, most commonly diabetes or intravenous drug use. Although ESR and CRP may be elevated, they are neither specific nor sensitive. Cerebrospinal fluid (CSF) cultures in patients with an SEA are positive in fewer than 25% of cases and have limited efficacy. Ultimately, the most sensitive diagnostic test is magnetic resonance imaging (MRI) with gadolinium contrast. Abscesses extend longitudinally along the cord and can involve multiple spinal cord segments; thus, the entire spinal column requires imaging as the infection may be noncontiguous. Treatment via early surgical decompression and antibiotic therapy is crucial. Empiric antibiotic therapy should include vancomycin with cefotaxime, ceftriaxone, cefepime, or ceftazidime. Without emergent surgery, the patient could be permanently paralyzed and may experience paralysis of the diaphragm. 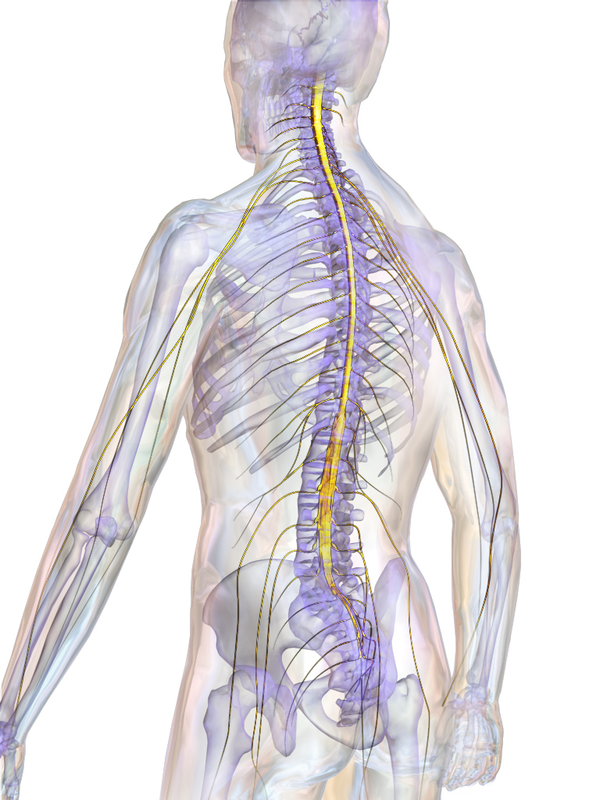 [4,7,8] Spinal cord injury may occur due to multiple mechanisms, including compression, thrombosis of neighboring vessels, ischemia, and inflammation secondary to bacterial toxins. Prognosis is directly related to the duration and severity of symptoms prior to surgical decompression. Cauda equina syndrome (CES) is the compression and subsequent injury to the cauda equina, the bundle of nerve roots formed from the lumbar and sacral levels. Disc herniation is the most common cause. Other causes include tumor, SEA, spinal stenosis, spondylosis, and inflammatory processes. Major risk factors include history of malignancy, size of disc herniation, and obesity. CES has an incidence of approximately 1 per 33,000 to 1 per 100,000 and is more common among patients with preexisting lumbar disc herniations and military personnel. Onset of symptoms may be acute or gradual. The workup includes MRI and, just like with SEA, the treatment is urgent surgical decompression within 48 hours. Computed tomography (CT) myelography is an acceptable alternative when MRI is unavailable. While CES can be caused by several processes, it can itself be a sequalae of SEA. If an SEA is located in the lumbosacral region and compresses the nerve roots, the abscess has, in essence, caused a CES. 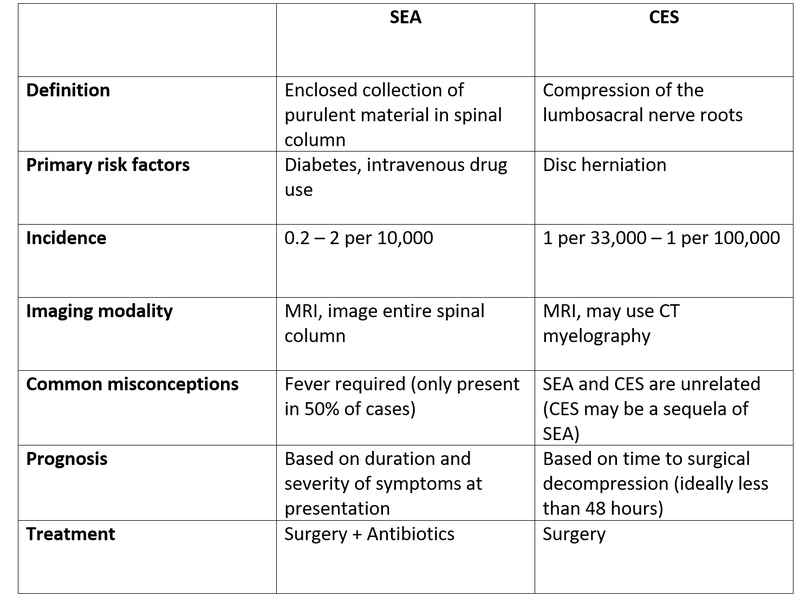 However, CES and SEA remain distinct entities that should be differentiated, especially in regard to treating underlying conditions (Table 1). 1. Sayed ME, Witting MD. Low yield of ED magnetic resonance imaging for suspected epidural abscess. Am J Emerg Med. 2011;29(9):978-982. 2. Epidural abscess. In DynaMed Plus. EBSCO Information Services. http://www.dynamed.com/login.aspx?direct=true&site=DynaMed&id=114920. Updated May 15, 2014. Accessed September 5, 2017. 4. Vakili M, Crum-Cianflone N. Spinal Epidural Abscess: A Large Series of 103 Cases. Open Forum Infect Dis. 2016;3. 5. Sexton, DJ, Sampson, JH. Spinal epidural abscess. In: UpToDate, Post, TW (Ed), UpToDate, Waltham, MA, 2014. 6. Rosc-Bereza K, Arkuszewski M, Ciach-Wysocka E, Boczarska-Jedynak M. Spinal Epidural Abscess: Common Symptoms of an Emergency Condition. Neuroradiol J. 2013;26(4):464-468. 7. Alerhand S, Wood S, Long B, Koyfman A. The time-sensitive challenge of diagnosing spinal epidural abscess in the emergency department. Intern Emerg Med. 2017. 8. Lee J-S, Ryu J-H, Park J-T, Kim K-W. Quadriplegia caused by an epidural abscess occurring at the same level of cervical destructive spondyloarthropathy: a case report. BMC Musculoskelet Disord. 2017;18(1). 9. Eisen, A. Anatomy and localization of spinal cord disorders. In: UpToDate, Post, TW (Ed), UpToDate, Waltham, MA, 2014. 10. Cushnie D, Urquhart JC, Gurr KR, Siddiqi F, Bailey CS. Obesity and spinal epidural lipomatosis in cauda equina syndrome. Spine J. 2017. 11. Cauda equine syndrome. In DynaMed Plus. EBSCO Information Services. http://www.dynamed.com/login.aspx?direct=true&site=DynaMed&id=115961. Updated August 20, 2014. Accessed September 27, 2017. 12. Fraser S, Roberts L, Murphy E. Cauda Equina Syndrome: A Literature Review of Its Definition and Clinical Presentation. Arch Phys Med Rehabil. 2009;90(11):1964-1968.